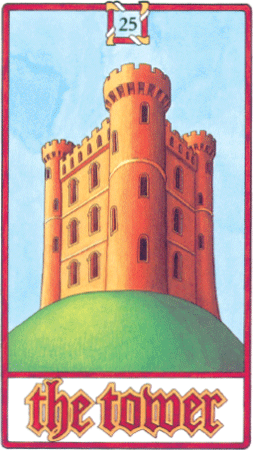 The Tower Card stands for the Ego. The Ego is Lain for 'I', the part in each of us who is 'managing director' of the different departments that make up the whole person. The Ego will put up defences, developing perhaps an outward personality that is a 'front' and sometimes does not reflect the sensitive soul within. We all need to build defences for ourselves and your ego is your strength and protection. But take care you don't become walled inside it.